Maidan self-defense members who have been demonstrating at the administration of the State Border Guard Service of Ukraine in Kyiv on Zolotovoritska Street since morning, have started picketing the building. 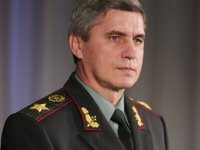 The activists say they are going to picket the building until State Border Guard Service Chief Mykola Lytvyn meets with them, a correspondent of Interfax-Ukraine reported. About 20 people are located close to the doors of the service's administration, and dozens of automobile tires have been laid there. Earlier a representative of the presidential administration came to the activists and heard the demands of the picketers for the resignation of Lytvyn. Later, the rally holders expressed a new demand – to immediately meet with government leaders. Otherwise, they said they would picket Zolotovoritska Street day and night.